Spotlight Selections, "Songs for the Season" presented by Jamestown Piano Shop! Piano students are encouraged to participate again this year! New performers are always welcome! Piano Teachers, Please spread the word! The Christmas music and pictures of each artist will be available online at jamestownpiano.com! Now your friends and relatives will be able to hear your performance wherever they are (with access to an internet connection). Your music and picture can also be easily downloaded and stored for future enjoyment on your home PC or Mac! You can even transfer it to your mp3 player or an mp3 capable cel-phone or burn it to a CD! (See the sample at the bottom of this page). 3. 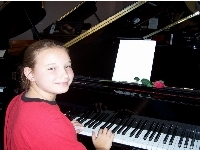 Go to jamestownpiano.com to view your photo and listen to your song. Be sure to tell friends and family about too! 4. Listen out for future opportunities to be in the "spotlight!" Call today and reserve a time slot! Send the Link to friends and family so they can hear you play!